Cinnamon has been identified as a natural supplement with the potential to improve blood sugar control. Many small research studies have investigated its use in diabetes with conflicting results. A new review study examined the effect of these supplements on fasting blood sugar control and cholesterol levels in diabetic patients. Data from 10 different trials that included 545 patients with type 2 diabetes were pooled. These participants took either cinnamon in capsule or powder form ranging in dose from 125mg to 6 grams daily or placebo for 4 to 18 weeks. Most subjects took the cassia form of this supplement. The results indicate that supplementation significantly reduced fasting blood glucose levels compared to placebo. Researchers noted that cinnamon reduced fasting blood sugar levels more than some newer prescription medications. Furthermore, cinnamon supplements reduced triglycerides, “bad” LDL cholesterol and total cholesterol levels in addition to boosting “good” HDL cholesterol counts. Investigators concluded that cinnamon supplements show promise in diabetes management but further research is required to determine dose and duration of therapy. In our opinion this review study highlights the health benefits of cinnamon supplements for diabetics. Not only does supplementation lower blood sugar but it also improves heart health by reducing cholesterol levels. The dose and duration of cinnamon supplementation varied widely amongst patients included in this review study. 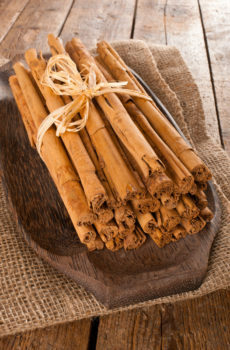 More research is required to assess the appropriate dose of cinnamon as well as to evaluate its potential side effects. None of the studies included in this review trial reported any adverse effects from supplementation. However, in some animal trials high doses of cassia cinnamon have been associated with potential liver toxicity and bleeding risk due to coumarin, a fat-soluble toxin. We would recommend taking cassia cinnamon in a water soluble form on an empty stomach to help mitigate the risk of toxicity. Ceylon cinnamon maybe a safer alternative as it contains virtually no coumarin but it has not been adequately studied in human subjects for blood sugar control. Cinnamon supplements should not be used in replacement of prescribed diabetic medications. Always check with your integrative health provider before starting a cinnamon supplement.